Charisma means “compelling attractiveness or charm that can inspire devotion in other,” according to the Oxford English Dictionary. Webster’s Dictionary takes it a step further: “a personal magic of leadership arousing special popular loyalty or enthusiasm for a public figure,” or “a special magnetic charm or appeal” (https://www.merriam-webster.com/word-of-the-day). An early version of the word, charism, was in the language in the 17th century, meaning a spiritual gift from God, and karisme was evident in late Middle English with the meaning of divine grace, but neither of those forms carried forward into Contemporary English. More recently, according to etymonline, the “[m]eaning ‘gift of leadership, power of authority’ is from c. 1930, from German, used in this sense by Max Weber (1864-1920) in “Wirtschaft u. Gesellschaft” (1922). More mundane sense of ‘personal charm’ recorded by 1959.” The last meaning is an example of the linguistic principle of generalizing, where a word moves from a specific meaning to a more general meaning (the opposite also happens and is called narrowing, e.g. deer, which in Old English [deor] meant just any wild quadruped). 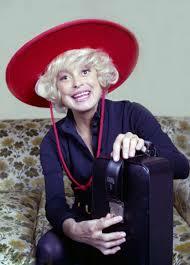 On this date in 1921, Carol Channing was born. My earliest memories of Channing was seeing her on game shows, but her career started much earlier. She first made it big playing Lorelei Lee in the Broadway production of Gentlemen Prefer Blondes, and then won a Tony Award for her performance of Dolly in the Broadway production of Hello, Dolly! But I didn’t know that as a kid growing up in Bethlehem, PA. My thoughts, as I remember them, were something like, “Who is this crazy, stupid blonde, and how did she get on television.” But I couldn’t have been more wrong. Channing wore wigs to get that wild blonde look because she was, apparently, allergic to bleach and so couldn’t get the bleach-blonde look the (un)natural way. She went to a prestigious high school in San Francisco and then majored in drama at Bennington College in Vermont. She also worked as a model, which is not surprising for a woman who was over 5’9”. So in 1978, I was in college at Davidson, and I took a theater class with Dr. Rupert Barber which included a trip to New York City to see some shows and the Metropolitan Opera. During that trip I went to the Lunt-Fontaine Theater to see Hello, Dolly in preview with my friend Ellen Schlaefer (now director of opera studies at the University of South Carolina). Honestly, I wasn’t expecting that much, except that it was on Broadway. So, this is my remembrance, and I cannot guarantee that this is absolutely what happened. The show opened with a fairly big production number, the outside of a café, young male waiters (dancers) leaping and dancing around the stage, carrying serving trays, and being fantastically athletic. And then the 57-year-old Channing came out onto the stage, this tall, skinny string bean with an enormous head and a mouth too big even for that enormous head, and more teeth than any two people. And everything else on stage just faded into the background. All the dancers, the set pieces, the music—everything just faded into the background as every eye went to Channing, who completely dominated the stage like no actor I have ever seen before or since. And I understood what people mean when they talk about “stage presence.” She had charisma. Carol Channing died on January 15, 2019, a little over 2 weeks ago. RIP.